To request Technical assistance contact the ITSN Specialist in your area. What is a TA Plan? 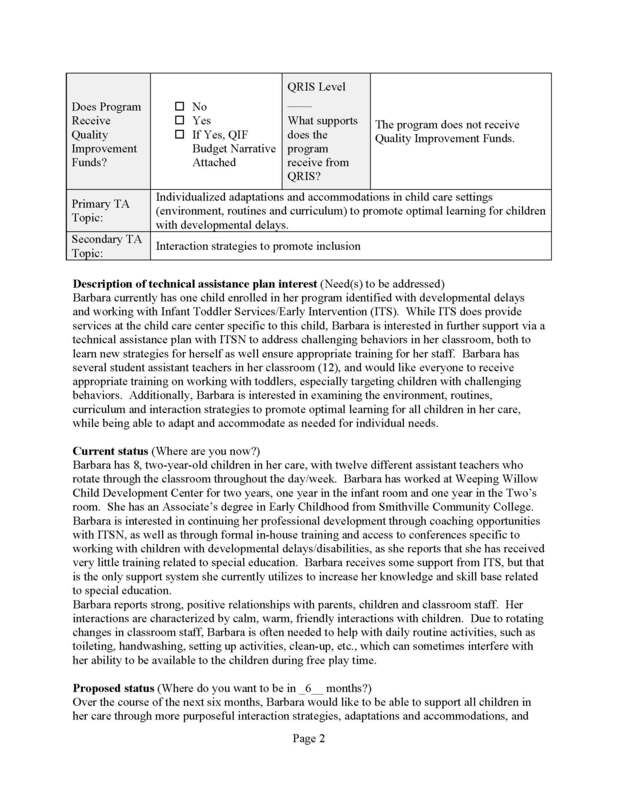 One strategy utilized by KCCTO-KITS ITSN to address the needs of an individual or child care center is an individualized technical assistance (TA) plan. These plans are conceptualized to meet the needs of individuals or groups wishing to expand skills in their own work environment, rather than in a traditional or formal training situation. 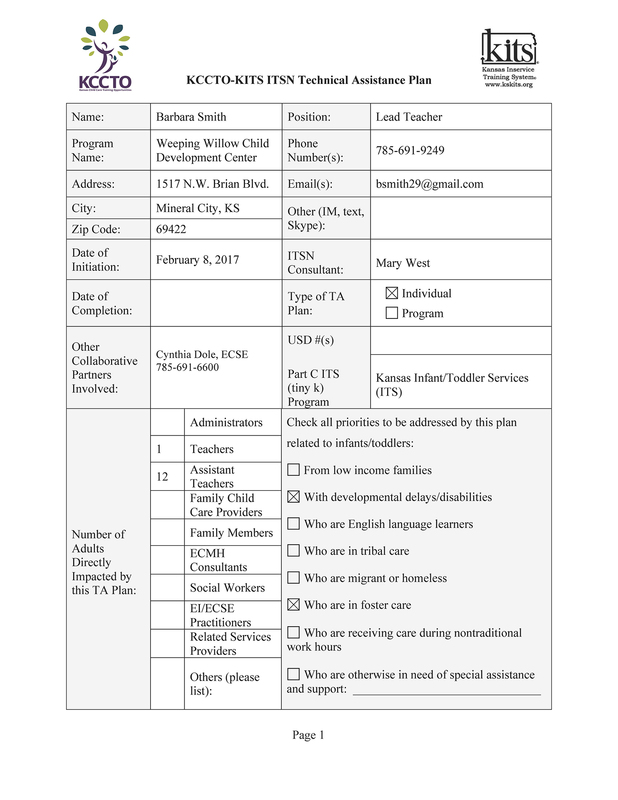 Any child care provider can request technical assistance from KCCTO-KITS. 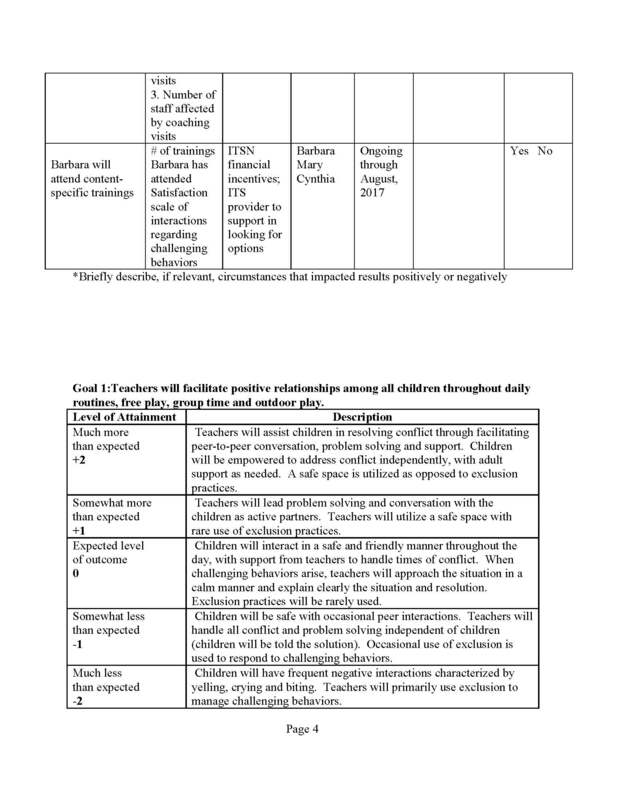 The design for focused assistance through development of an individualized TA plan is consistent with current research suggesting that "professional development is more likely to be effective when it is long term, focuses on changes at multiple levels (individuals, programs, organizations), and is aligned with policies, standards, and expected child and family outcomes" (Winton, McCollum, & Catlett, 2011, p. 263). 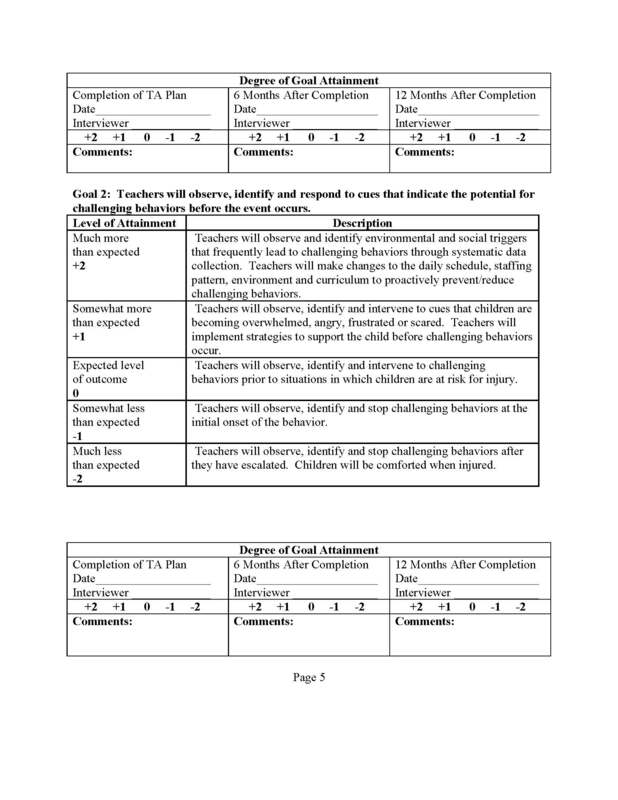 The KCCTO-KITS TA plan combines training (knowledge acquisition) with assessment of implementation (knowledge utilization), two components predictive of effective change (Fixen, Naoom, Blasé, Friedman, & Wallace, 2005). Fixen, D.L., Naoom, S.F., Blasé, K.A., Friedman, R.M., & Wallace, F. (2005) Implementation research: A synthesis of the literature. Tampa: University of South Florida, Louis de la Parte Florida Mental Health Institute. Winton, P.J., McCollum, J.A., & Catlett, C. (2011) A framework and recommendations for a cross-agency professional development system. 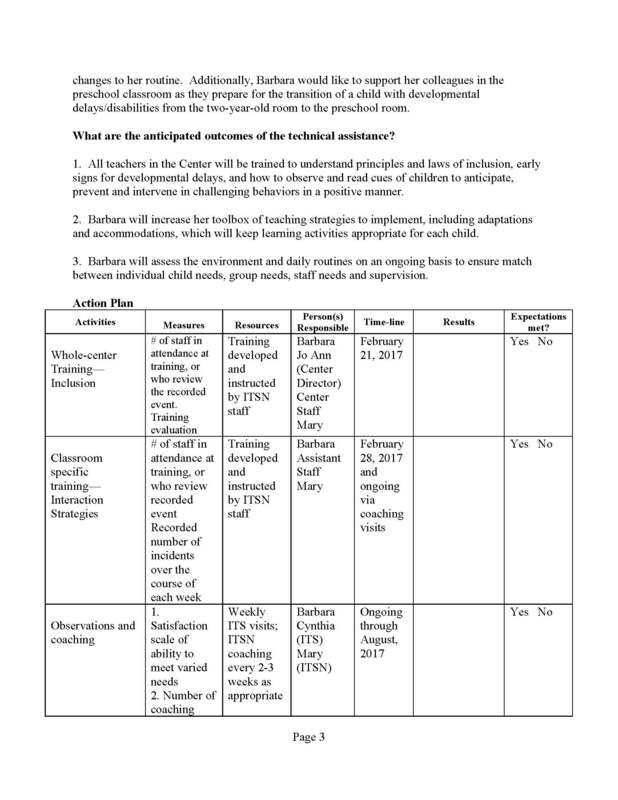 In Winton, McCollum, & Catlett (eds) (2011) Practical approaches to early childhood professional development, Washington, DC: Zero To Three National Center for Infants, Toddlers, and Families, pp. 263-272. 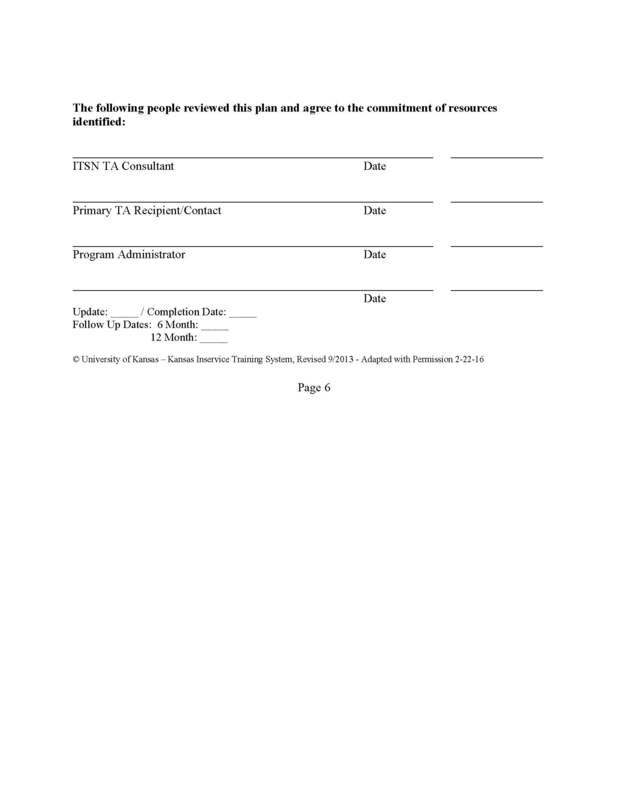 This link opens the Example of a KCCTO-KITS ITSN Technical Assistance Plan in PDF format.